A Long Veil on a Windy Day Makes for a Dramatic Wedding Photo. All of my wedding clients do receive some traditional wedding photographs. I think these photos are important. Even if you're not so traditional, I believe as years go and you look back on your wedding day, you and your family will cherish them as well. I love incorporating nature in my wedding photography. Whether it’s a sunny day at Golden Hour, a hard rain or a light shower, snowflakes gently floating down or a gust of wind blowing by, Mother Nature can add a lot to your wedding photographs. So try to embrace Her and you may be pleasantly surprised. Here the bride playfully lets the wind take her veil. We did plenty of photos where we can see her face, but I love the composition in this photograph as she turns and the wind takes her veil around her and blends it into the clouds. 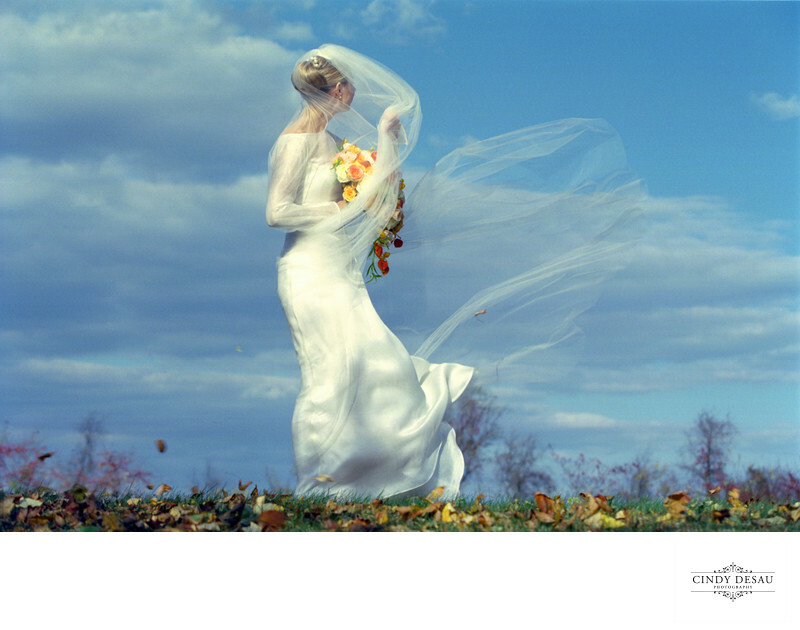 Her movement combined with the flow of the veil makes this one of my favorite wedding photographs.